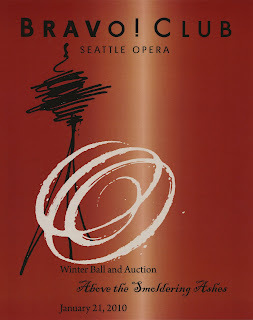 Join the young opera lovers of Seattle Opera’s BRAVO! Club high “Above the Smoldering Ashes” at the Space Needle for a party celebrating Il Trovatore and the company’s Young Artists. The club’s annual Winter Ball and Auction is January 21, and as always, all proceeds benefit the Young Artists Program. The evening begins with a silent auction—where items range from a Wii console to a private screening at Magnolia Audio Video’s state-of-the-art theater—and also includes a performance by Young Artists Erik Anstine and Vira Slywotzky (who’s currently performing as Inez in Il Trovatore), plus dancing and the opportunity to check out the Observation Deck of the Space Needle for a beautiful 360 degree view of Seattle. Visit BRAVO! online for more details or to RSVP for the party.